In financial marketsFinancial MarketsFinancial markets, from the name itself, are a type of marketplace that provides an avenue for the sale and purchase of assets such as bonds, stocks, foreign exchange, and derivatives. Often, they are called by different names, including "Wall Street" and "capital market," but all of them still mean one and the same thing., liquidity refers to how quickly an investment can be sold without impacting its price. The more liquid an investment is, the more quickly it can be sold (and vice versa). All else being equal, more liquid assets trade at a premiumLiquidity PremiumA liquidity premium compensates investors for investing in securities with low liquidity. Liquidity refers to how easily an investment can be sold for cash. T-bills and stocks are considered to be highly liquid since they can usually be sold at any time at the prevailing market price. and illiquid assets trade at a discountDiscount RateIn corporate finance, a discount rate is the rate of return used to discount future cash flows back to their present value. This rate is often a company’s. In accounting and financial analysis, a company’s liquidity is a measure of how easily it can meet its short-term financial obligationsCurrent LiabilitiesCurrent liabilities are financial obligations of a business entity that are due and payable within a year. A company shows these on the balance sheet. A liability occurs when a company has undergone a transaction that has generated an expectation for a future outflow of cash or other economic resources..
Below is an example of how many common investments would typically be ranked in terms how quickly they can be turned into cash (of course, the order may be different depending on the circumstances). Real EstateReal EstateReal estate is real property that consists of land and improvements, which include buildings, fixtures, roads, structures, and utility systems. Property rights give a title of ownership to the land, improvements, and natural resources, such as minerals, plants, animals, water, etc. As you can see in the list above, cash is, by default, the most liquid since it doesn’t need to be sold or converted (it’s already cash!). Stocks and bondsBondsBonds are fixed-income securities that are issued by corporations and governments to raise capital. The issuer borrows capital from the bondholder and makes fixed payments to them at a fixed (or variable) interest rate for a specified period. What is an Indenture? An indenture is a binding contract between an issuer can all typically be converted to cash in about 1-2 days, depending on the size of the investment. Finally, slower-to-sell investments such as real estate, art, and private businesses take much longer to convert to cash (often months or even years). Items on a company’s balance sheet are typically listed from the most to the least liquid. Therefore, cash is always listed at the top of the asset section, while other types of assets such as Property, Plant & Equipment (PP&E)PP&E (Property, Plant and Equipment)PP&E (Property, Plant, and Equipment) is one of the core non-current assets found on the balance sheet. PP&E is impacted by Capex, Depreciation and Acquisitions/Dispositions of fixed assets. These assets play a key part in the financial planning and analysis of a company’s operations and future expenditures are listed last. Below is a screenshot of Amazon’s 2017 balance sheetBalance SheetThe balance sheet is one of the three fundamental financial statements. These statements are key to both financial modeling and accounting. The balance sheet displays the company’s total assets, and how these assets are financed, through either debt or equity. Assets = Liabilities + Equity, which displays its assets and liabilities in order of their liquidity, as well as its stockholders’ equityStockholders EquityStockholders Equity (also known as Shareholders Equity) is an account on a company's balance sheet that consists of share capital plus retained earnings. It also represents the residual value of assets minus liabilities. By rearranging the original accounting equation, we get Stockholders Equity = Assets – Liabilities. 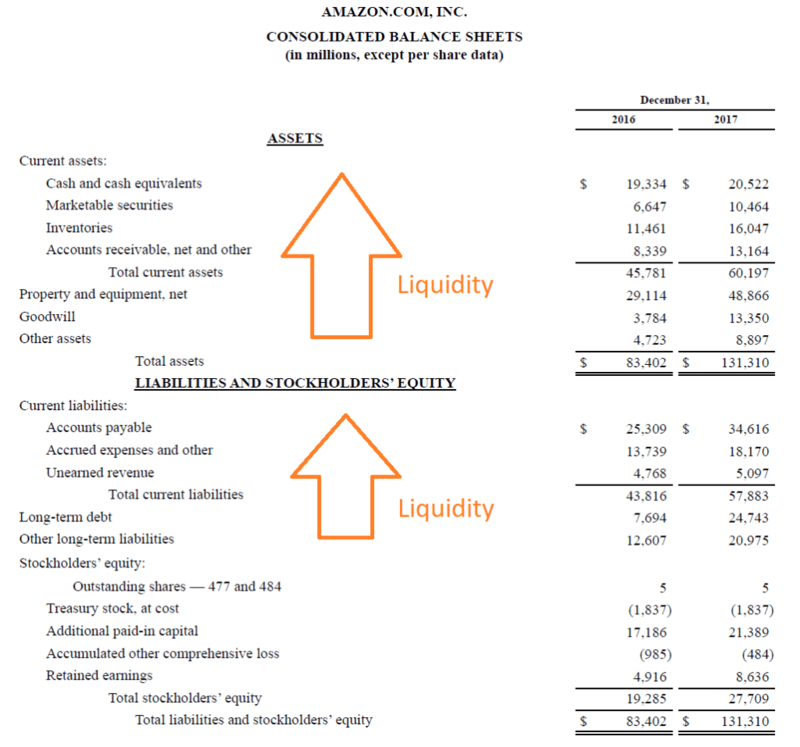 As you can see in the image, Amazon’s assets are separated into two categories, current asset and non-current assets (everything else). For most companies, these are four of the most common current assets. Their liquidity, however, can vary. For many companies, accounts receivable is more liquid than inventories (meaning the company expects to receive payment from customers faster than it takes to sell products in inventory). To learn more, check out CFI’s Advanced Financial Modeling Course on Amazon. Current AssetsCurrent AssetsCurrent assets are all assets that can be reasonably converted to cash within one year. They are commonly used to measure the liquidity of a company. A company’s assets on its balance sheet are split into two categories – current assets and non-current assets (long-term or capital assets).